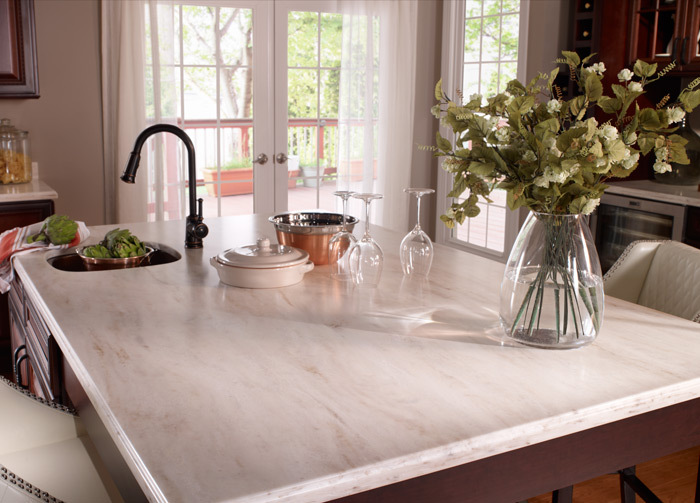 Since their introduction nearly 50 years ago solid surface countertops have proven to be as beautiful as they are timeless. Today's manufacturers offer bold and vibrant colors and patterns that fit as perfectly in a traditional ranch style kitchen as they do in a ultra modern design sculpted around stainless steel and glass. Solid surface countertops are nonporous, never need to be sealed and are easy to clean and maintain. NSF-51 certified they are perfect for food prep areas. Manufactured from high impact acrylic plastics they have a soft finish that won't damage dinner and glassware. Their warmth is inviting and their surface forgiving. While scratches in granite or quartz require professional refinishing and polishing, solid surface tops can be renewed with a light sanding. Another benefit of solid surface material is that it only weighs 5 pounds per square foot compared to 18 to 20 pounds per square foot of granite and 16 to 23 pounds per square foot of quartz. In a kitchen with 60 sq. ft. of countertops that translates into countertops that weight only 300 pounds rather than tops that can weigh more than 1,300 pounds. That means less stress on base cabinets and floor systems. Finally, because solid surface material is an acrylic plastic seams are bonded together without a gap, are absolutely smooth and inconspicuous. When backsplashes and solid surface sinks are integrated you are able to create a single flowing countertop surface. It's said that beauty is only skin deep but the color and pattern of solid surface countertops runs through the entire depth of the material. If you are building or remodeling you owe it to yourself to check out the look, feel and beauty of solid surface materials. From counter and vanity tops to tub decks and tub and shower surrounds, solid surface materials will be at home in every room of your house.